CANCELLATION POLICY:Within 14 days 100% of total revenue will be forfeited. We reserve the right to cancel any reservation, subject to issuing a full refund. In the event of a guest cancellation outside of 14 days, a $50.00 restocking fee will apply to all canceled reservations. Individual rate policies may vary. Minimum Age: 23 We do not allow persons under ourage policies to occupy a property unless accompanied by someone over at or overage requirements. PAYMENT: Paymentfor your reservation can be made by Visa, Mastercard, American Express andDiscover Card. All reservations require the reserving party to have acredit card on file. The first night’s stay, plus tax will be chargedimmediately upon booking. The balance will be charged in full 14 days prior to arrival. We recommend3rd party trip insurance. CANCELLATION POLICY:Within 14 days 100% of total revenue will be forfeited. We reserve the right tocancel any reservation, subject to issuing a full refund. In the event of aguest cancellation outside of 14 days, a $50.00 restocking fee will apply toall canceled reservations. Individual rate policies may vary. Paymentof the initial reservation charge constitutes acceptance of the Terms andConditions. We may, in our absolute discretion, cancel the reservation ifwe are of the opinion that the reservation information provided is falsified orincomplete. We shall be entitled to vary, amend and/or otherwise changethese terms and conditions at any time without prior notice. You shall indemnifyand hold us harmless in respect of any liability, loss, damage, cost andexpense of any nature arising out of, and/or in connection with the acceptanceof the reservation. The reservation terms and conditions set out hereinshall be governed in accordance with the laws of the State of Florida. A valid government issued identification or passport is required at check-in. Early check-ins are available upon request subject to room availabilityand occupancy level. Late check-outs are available upon request subject to roomavailability and occupancy level. Late check-outs are 20.00 per extrahour upon availability. Must contact the front desk for the request. Ifavailable, a late checkout fee of $20.00 per hour will apply. Hours ofOperations The office is open Monday –Sunday: 9:00 am till 7:00 pm. For after-hours assistance, please call941-203-8058 To comply with a county-mandated noise ordinance, the Tiki areasand or outside areas close at 10:00 pm SHARP! OCCUPANCY OF UNIT: Allpersons occupying a unit (“Unit”) must be listed by the reserving party on thereservation at time of registration and shall be the only persons entitled tooccupy the unit or use any of the resort amenities during occupancy of theUnit. The person who made the reservation is responsible for the condition of theUnit, damages thereto or missing items therefrom and for ensuring that alloccupants and guests comply with the Terms and Conditions herein. Alloccupants and guests of occupants must abide by all Federal, State and locallaws and must conduct themselves in an appropriate first-class manner. Uponcheck out, the reserving party is responsible for leaving the unit in goodorder before departure and for ensuring that the Unit is, upon departure, inthe condition that it was at the commencement of the stay. All furnitureand accessories shall be returned to their original location. ALL GUESTS OFOCCUPANTS MUST REGISTER WITH FRONT DESK AND SHALL NOT BE PERMITTED TO OCCUPYTHE UNIT UNDER ANY CIRCUMSTANCE. UNDER NO CIRCUMSTANCES SHALL THE NUMBER OFOCCUPANTS EXCEEDS THE MAXIMUM NUMBER OF OCCUPANTS. Security Deposit/ Damage: In lieu of a security deposit, we require thereserving party to provide us with a valid credit card which will be authorizedfor $500 upon Check In.Authorization will be released no more than 24 hours after departure when theunit is inspected. By booking this reservation, we reserve the rightto charge the booking party’s credit card up to an additional $500.00 for anymissing items, or for any damage, the reserving party or any occupant and/orguest of the reserving party may have caused to the Unit. At the time ofcheck-out, if the Unit is not left in a reasonable and clean condition, or inthe event of missing items, or if any unpaid balance is still due, then thereserving party agrees and acknowledges that their credit card listed on filefor the reservation will be charged to clean, replace, and/or repair said itemsat the fair market price or make any unpaid payments pursuant to the terms ofthe reservation agreement. Free Bike rental up to 3 hours * all occupants are required to signLiability Waiver prior to use of any Bike and/or amenity. All occupantsare required to use a helmet prior to using Bike or life vest prior to usingwater-sports, it is also occupant’s responsibility to request ALL safety equipment.$100 fee may be charged for lost or damaged bicycles. Riding on the beach isexpressly prohibited. ACTS OF GOD: Occupant(s)acknowledges that, due to the nature of Florida weather, their vacation staymay be scheduled during a time of inclement or undesirable weather, including,without limitation, rain storms, tropical storms, hurricanes and the like (“Actof God”) In the event of an Act of God, or any inclement weather, including,without limitation, adverse weather, tornadoes, hurricanes, storms, fire.,etc., we will not be responsible for any refunds for monies already paid, forpreparing the Unit for any upcoming anticipated or unanticipated Act of God, orfor providing lodging elsewhere. Occupant(s) acknowledges that, depending onthe nature of the inclement weather or Act of God, evacuation may be required.In the event that any State, County or local government orders a voluntary ormandatory evacuation of the Unit due to inclement weather or Act of God,Occupant(s) agrees to immediately evacuate the Unit. This is for the safety andprotection of our Occupants and Guests. After check-in, any unusedportion of the reservation due to termination or early departure for any reasonis non—refundable. In the event of an Act of God, including, without limitation,adverse weather, tornadoes, hurricanes, storms, fire., etc., we will not beresponsible for any refunds for monies already paid, for preparing the Unit forany upcoming anticipated or unanticipated storm, hurricane or other Act of God,or for providing lodging elsewhere. RATE CHANGES: Ratesare subject to change without notice. Confirmed booking rates will be honoredfor the reservation booked. Any additional nights will be subject to marketrates which may be higher and are subject to availability. ALL Units are non-smoking. Any smoke smell inside the Unit will resultin a $250.00 fee being charged to the credit card on file. Please refrain fromapplying sunscreen in the Unit. Any damage to the Unit as a result ofsunscreen being applied in the Unit will result in a $200 fee being charged tocredit card on file. Beachside Management Properties: Upon departure: A$100.00 additional cleaning fee charge will be charged to the credit card onfile if all trash is not disposed of. TRASH: All of our homes have curbsideservice. Waste Management will dispose of your trash for you as long as thetrash cans are in their designated space on the side of the property. CountyTrash Pick-up is on Thursdays, subject to Holidays. NOISE ORDINANCES: Siesta Key and surrounding areas do have noiseordinances with which all occupants and guests must comply. Noise ordinances gointo effect at 10:00 pm and pertain to loud music, loud voices, or other loudsounds coming from a property after 10:00 pm. If we or the police are calleddue to the occupants or any guests disturbing of the peace or violation of anynoise ordinance we reserve the right to terminate occupancy and requireimmediate vacation of the Unit, in which case no money will be refunded to the reservingparty. POOL AND HOT TUB: Hours OF USE: DAWN to DUSK. The pool andhot tub are to be used entirely at the own risk of the Unit occupants and theirregistered guests. Pool and hot tub use is restricted to registeredoccupants and approved registered guests only. Children must be supervised byan adult at all times while in the pool/hot tub area. NO DIVING, BEACH OR SANDTOYS IN THE POOL. NO THROWING OF BALLS, TOYS or RUNNING shall be permitted inthe POOL/HOT TUB AREA. NO GLASS SHALL BE PERMITTED IN POOL/HOT TUB AREA. Pool/ Hot Tub Located off property. GUEST POLICY: Reservingparty is responsible for the behavior of occupants and registered guests at alltimes. Any additional occupants or guests of the reserving party must beapproved by management and the guest checking in at the management office. Novisiting guest may sleep overnight in the Unit. In no event shall anyreserving party have more than the maximum number occupants permitted, norshall any occupant or visiting guest be permitted to occupy the Unit beyond itsmaximum capacity. Any violation of this policy shall result in our right toimmediately terminate the occupancy without refund. ACCIDENTS, INJURY OR LOSS: The owners, staff and management ofBeachside Management and the owner of any real property upon which any Unit orany of the amenities provided with the Unit rental are located are notresponsible for accidents, injury, death, or claims or damages of any kind orloss of personal belongings of any kind to guest or any other person, or damageto any property occurring on the premises, any amenity property, or the commonareas thereof. The reserving party, individually and on behalf ofits occupants and guests, shall indemnify, defend, and hold harmless BeachsideManagement and the owner of any real property upon which the Unit is located,from any and against all liabilities, injuries, claims, expenses, fees, loss ofuse, damages, or actions or claims of any kind arising out of Renter’s or anyof its occupants or guests’ use and occupancy of the Unit and amenitiesprovided therewith, no matter how caused. Neither Beachside Management nor anyproperty owner shall be responsible for acts of theft, vandalism or otherdamage to a guest(s) personal property or vehicle. AIR CONDITIONING: The fan should be set to AUTO and system on COOL. Do not set air conditioner thermostat below 74°F. Do not operateair conditioner with windows open. GARBAGE DISPOSAL: Please do not put any item besides TOILET PAPERin the TOILET. Paper towels, baby wipes, feminine products etc. – anythingbesides toilet paper provided – may cause a plumbing issue. If this occurs, theguest will be responsible for the service call and repair. Likewise, please donot put peelings or any fibrous materials through the disposal. Run plenty ofwater and feed material SLOWLY into the unit when using the disposal. Any purebred or crossbred dog comprised of any of the following breeds:Pit Bull-type, Rottweiler, German Shepherd, Husky-type (including Siberianbreeds),Malamute, Doberman Pinscher, Chow-Chow, Any Wolf-dog hybrid or Anyother dog that has been known to have bitten anyone where the injury requiredmedical attention, or where any insured or any tenant, guest or visitor of theinsured knew that a dog was potentially dangerous. FURNITURE AND ACCESSORIES: Furniture and accessory furnishings arenot to be removed from the Unit. The 2 Folding beach chairs provided, and anyother equipment, or items, provided by Beachside Management, are to be used bythe occupants for their intended use only. If any furniture or accessorylocated with the Unit is lost, damaged or stolen the reserving party will becharged for the replacement value of the missing item. Blankets and bath towelsmust remain in the Unit. Beach towels are provided, and they may be used forthat purpose. An inventory will be taken before and after each arrival anddeparture. Each rental Unit is privately owned and may offer certainfurniture and accessory furnishings/appliances, while others do not. BeachsideManagement is not responsible for providing any additional furniture,furnishings or appliances whatsoever. Accommodations range from luxury homes tobasic cottage units. All privately owned Units are individually furnished andequipped with basic items such as linens, pillows, blankets, cookware, flatware,dishes, glasses, other small appliances and cable television. Other items mayor may not be provided. The quality of said items provided at each Unit mayvary. We strive to maintain each Unit in a neat and clean condition andmaintain all equipment and appliances in good working order. In the event youexperience any equipment failure, please notify us immediately so we can orderrepairs, as necessary. The Renter and its occupants and guests waive andrelinquish any rights or claims against the individual property owners orBeachside Management for any damage that may result to the Renter or anyoccupant or guest from lack of maintenance, cleanliness, repairs or propertydefects. There will be no refunds of all or any portion of the reservation amountfor any equipment failure of any kind. In the event maintenance or repairs to aUnit are necessary during the stay, it is understood and agreed that servicetechnicians may require access to the Unit, with or without formal notice. LEGAL NOTICES: Failure to abide by these Terms and Conditions, orFlorida Law, will, in our sole discretion result in the termination of theoccupancy without refund. The laws of the State of Florida govern thisagreement. We reserve the right of entry to the Unit at any time. While theinformation provided on our website is accurate to the best of our knowledge,it is understood that the information supplied is for guidance purposes onlyand does not form part of this Terms and Conditions Agreement. The prevailingparty in any lawsuit to enforce or interpret any provisions of this agreement,or relating to arising out of the this Agreement, the guest reservation, gueststay and use of the Unit or any amenities provided with said Unit, shall beentitled to an award of its attorney’s fees and costs incurred including,without limitation, attorney’s fees and costs incurred in pre-suit proceedings,pre-trial, trial, and appellate proceedings. This agreement contains the entireagreement between the parties. It may only be changed in writing signed by theparty against whom enforcement of any waiver, change, modification, extensionor discharge is sought. Renters cannot assign or transfer this agreement. Byreserving this unit and therefore agreeing to this agreement you give BeachsideManagement the permission to send you ongoing marketing, promotional, andspecial discount type communications. These are offered various times ofthe year and can be unsubscribed from if so desired.By accepting this RentalAgreement as the guest, you agree to be responsible for any damage(s) to theunit, dwelling, furnishings, grounds or common area which occur through acts ofnegligence of or by you, your family, friends or social guests. Guest agrees tosurrender the Unit and personal property, furniture, and furnishings containedtherein, at the time and date specified in as good condition as it was at thebeginning of your stay, except for reasonable wear, act of God, and/or causesover which you have no control. If the unit is not left in satisfactorycondition, you will be charged for repair and restoration to satisfactorycondition, plus lost rent time. Guest agrees to pay a reasonable attorney feeand all court costs and expenses to enforce this agreement including appellateproceeds with or without legal proceedings. Guest may not sublet the Unit atany time. Guest CERTIFIES that he/she has read carefully and understands thelimitations on a rental unit as set forth in this Lease Agreement. Guest ALSOCERTIFIES that he/she understands the limitations of the number of personspermitted to occupy a unit and the applicable fees. Guest fully agrees to abideby all such limitations and the foregoing Terms and Conditions. 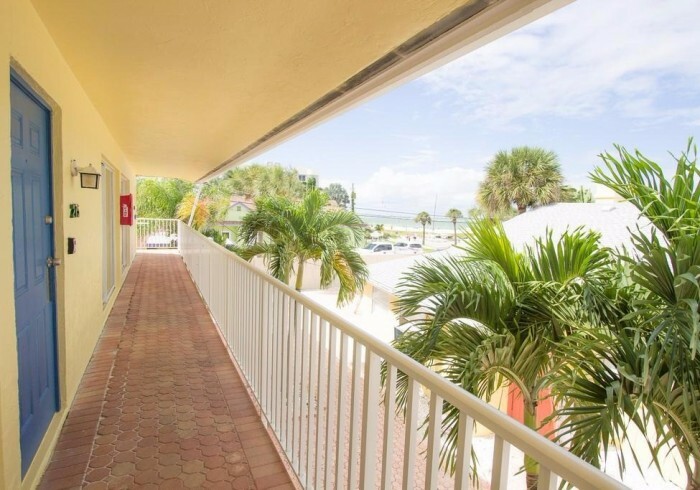 Located in Siesta Key Village, this condo is 300 yards to the NUMBER ONE BEACH in the US. Included with your stay: Complimentary Bicycles, Beach chairs, Beach-Towels, Free-rides around Siesta and a 7-day week office for your convenience and guest needs.Property Features: Access to an outdoor pool (located just down the street at Siesta Key Beachside Villas), free self-parking are available at this smoke-free condo. Room Amenities: All 6 individually decorated condos feature free WiFi and sofa beds. Guests will find kitchenettes with refrigerators, stovetops, and microwaves. Heated Pool Access is available at our resort, Siesta Key Beachside Villas. 124 Columbus Blvd. Fitness center discounts are available at Siesta Key Fitness.